THOMPSON, JOHN SPARROW, editor, teacher, and writer; b. 1795 at Waterford (Republic of Ireland); m. 24 March 1829, in Halifax, N.S., Charlotte Pottinger, and they had seven children, two of whom seem to have died in infancy; d. 21 Oct. 1867 at Halifax. John Sparrow Thompson’s parents are almost unknown. His father died before Thompson was 24 and his mother, Mary (Sparrow?) Thompson, in 1832. Both were Methodists, reflecting, no doubt, John Wesley’s mission to Waterford, 1747–53. About 1818 Thompson left Waterford for London. His life there may not have been altogether satisfactory; as early as 1819 his mother was writing that work could apparently be found in America. He may have been a shoemaker but does not seem to have had ambitions in a trade. He liked writing and became proficient at it. A friend wrote to him in 1826: “. . . what you feel you write in good style but you are deficient in the language of strong emotion, perhaps because you [think] . . . such language would be bombast. . . .” By this time Thompson had made up his mind. After a visit to Waterford, he sailed from England early in 1827 in the Osprey for Halifax. In 1828 he started a private school. Halifax’s score of private schools often provided a thin enough living for their instructors. Thompson had some real talent for teaching, having knowledge of mathematics and astronomy, and being well read in English literature and history. He was also an excellent shorthand writer, a subject his school taught. Advertisements for his school appear in the Novascotian in 1835–36 and 1844, and in the Royal Gazette in 1857. In the early 1850s he was a Halifax school commissioner, along with Alexander Forrester. Thompson’s teaching career was at times concurrent with, at others consecutive to, his editorial pursuits. In 1830 he became editor of the Halifax Monthly Magazine, a position he held until 1833. His facility in shorthand also brought him substantial extra income. 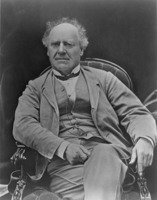 It was Thompson who reported Joseph Howe*’s speech at his libel trial of 1835. Shortly after this Thompson founded the Acadian Telegraph, a newspaper whose first number included the beginning of his “Compendious history of Nova Scotia. . . .” This history, characteristically perhaps, he never finished. The newspaper lasted from August 1836 until February 1838. Thompson then became editor of Howe’s Novascotian while Howe was in England from April to October 1838. In 1839 Thompson became editor of the Pearl, a literary weekly begun in 1837 and purchased by Howe in June 1839, which folded in August 1840. Thompson then became assistant editor, and subsequently editor, of the Novascotian until June 1842. Thompson felt he owed a great deal to Howe. “I have long considered myself in several ways your debtor,” Thompson wrote to him in 1836. And not infrequently Howe’s letters of the later 1830s have remarks on delightful rides with Thompson about Halifax and the province. Howe was as passionate and impulsive personally as was Thompson politically; Thompson had a more controlled and purposeful nature, and a keener, if less ductile, mind. Thompson was also quite unambitious, and, given his penchant for uttering unpalatable truths, was probably unsuited for public life. Nor was he well suited for business. The failure of the Acadian Telegraph might owe something to the times and the number of other papers, but also to Thompson’s unwillingness to sell himself or his paper. A friend wrote him in 1855 about the Athenaeum, with which Thompson was also associated: “. . . there must be business tact and energy. Especially there must be continuous personal application for Advertisements. . . .” These Thompson could not give. He neither sought money nor worried too much about the making of it. In this, at least, he and Howe resembled each other. They remained close friends for life. It was said Howe would rarely write anything of importance that he did not first submit to Thompson’s judgement. When Howe returned to office in 1848, in James Boyle Uniacke*’s Reform government, Thompson was reappointed queen’s printer and served until April 1854. He was then replaced by William Annand*, who accepted the office on condition that provision be made for Thompson. Apparently it was not, for Thompson went back to teaching and newspaper work. 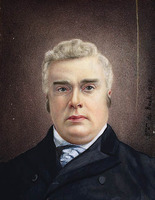 A Conservative government between 1857 and 1860 prevented any official appointment, but in 1860, on Howe’s return to power, Thompson was made chief official reporter for the assembly, which he remained until the electoral defeat of Howe’s government in 1863. 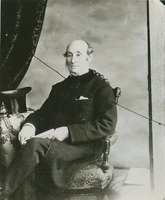 He was also appointed in 1861 chief of the money order department of the Nova Scotia Post Office, a position he held until just before his death. His chief literary work was a labour of love, a collected edition of the poetry of John McPherson* published in 1862. The extensive introduction suggests something of Thompson’s own viewpoint: “Much of a country’s wealth consists in her better minds. To allow the memory of such to disappear, may be considered about as inappropriate and injudicious, as would be the interring of money wealth. . . . Nova Scotia cannot afford to lose such property. . . .” McPherson, too, had had to teach, and his love of meditative peace was “sadly out of keeping with the noise, and roughness, and fagging, and poor pecuniary remuneration. . . .” There spoke Thompson’s experience, too. But he was of tougher metal: an unsparing, yet modest critic whose earnestness was enlivened with an Irish wit, and an Irish accent, which he retained to the end of his life. Irishman that he was, he loved debate and argument. Yet Thompson was a man of charity, unlike many tough-minded reformers. He would burst out against some wrongdoer in high places and afterwards express, as a friend put it, “sympathy for the wicked fool, notwithstanding his offences.” Thompson’s philosophy can be summed up in a sentence from the edition of McPherson: “The mind is the true kingdom of man. . . .” This great gift, together with his integrity, firmness, and spirit, were to be passed on to his more famous son, Sir John Thompson*. [An attractive, indeed haunting, portrait of J. S. Thompson by William Valentine* hangs in the PANS. There is a useful collection of letters including some from Howe and McPherson in the J. S. Thompson papers at PAC (MG 24, C4). There are also a few Thompson letters in the Howe papers (PAC, MG 24, B29). Primary sources should also include the newspapers he edited and the journals to which he contributed. In addition, there are at least two pamphlets: The building and its objects: an essay, read, – January 10, 1850, at the first public meeting of the Sons of Temperance in the new Temperance Hall, Poplar Grove, Halifax (Halifax, 1850); The eastern shore: report, to a committee of the Grand Division, S. of T., of Nova Scotia, concerning a temperance and educational mission to the eastern shore of Halifax County (Halifax, 1860). His book on McPherson is: Poems, descriptive and moral . . . (Halifax, 1862). P. B. Waite, “THOMPSON, JOHN SPARROW,” in Dictionary of Canadian Biography, vol. 9, University of Toronto/Université Laval, 2003–, accessed April 20, 2019, http://www.biographi.ca/en/bio/thompson_john_sparrow_9E.html.